Ever heard of Ming Ming. Chances are you have. Ming Ming was the worlds oldest Panda, and I am sorry to say was. 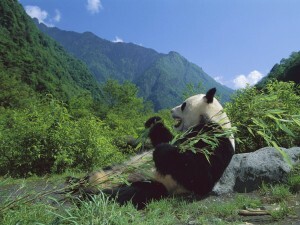 Aged 34, the Chinese panda Ming Ming died around a week ago. At the time, she was being held in the Xiangjiang Wild Animal World – in Guangdong Province China. In the wild, a giant panda like Ming Ming would usually survive for up to 30 years in captivity, or about 15-20 years in the wild, due to the more strenuous lifestyle. Ming Ming was the oldest panda in the world at 36, so we are at a great loss to see here go. It is thought that Ming Ming died of old age. Her organs were deteriorating, and last week this lead to kidney failure for the poor bear. Ming Ming had a very busy life, she travelled many places including Ireland, the United Kingdom and China. What a panda! Pandas are an endangered species, with only around 1,800 thought to still be alive in the entire world.